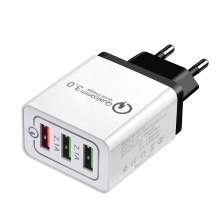 * 3 USB ports, support QC 3.0 fast charging, suitable for iOS and Android devices charging. * Compact design can be used for travel or home. * Lightweight and portable, easy to install. * 100 – 240V voltage for different country and district use. * Made of eco-friendly PC material, to ensure the long using time.